Are you an iPhone user? Have you ever lost your contacts, messages, pictures or even your music from your iPhone either by accident or your own deliberate actions? Have you ever lost anything from your iPhone and realized you do not have a backup or any way to recover what you lost? Then you must understand the need for data recovery for your device. Most smartphone users encounter such troubles from time to time and forever lose such data. No one likes losing important data especially when you know you may never recover it. But today I want to introduce you to a lasting solution that will ensure you recover anything you lose from your iPhone. With EaseUS iOS Data Recovery Pro you can recover contacts, messages, notes, call history, calendars, reminders, bookmarks, photos, videos, camera roll, Whatsapp chat history, message attachments even if you do not have a backup. You don’t have to lose any data anymore with this awesome tool; you can also recover your lost data from iTunes Backup. 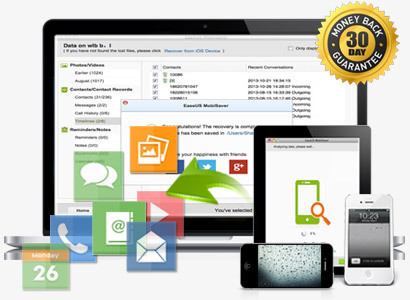 EaseUS iOS Data Recovery Pro is a mobile recovery software by EaseUS a leading software developer of backup and security software solutions that was established in 2004. EaseUS iOS Data Recovery Pro is an awesome software that will save you a lot of troubles, you don’t have to lose any data anymore with this software. Whether it is a lost or deleted data you can always recover it using this awesome tool. A free version of the EaseUS iOS Data Recovery Pro will allow limited access to the full potentials of this awesome tool, with a free version you can only recover limited data and most importantly you won’t have a free tech support service but a premium version will give you the full access to this software. A premium version allows you unlimited access to your lost or deleted data, you can recover in full your lost/deleted messages & Whatsapp chat history, recover lost/deleted contacts, photos & videos, Notes, Call history, Calendars, Reminders, Safari bookmarks and Timelines . The best part is that you can recover from iOS device even if you do not have a backup for your device, you can also recover from iTunes backup if you have one (including encrypted backup). This software supports Windows 8/7/Vista and XP and you can also enjoy a free tech support service. A premium version of the EaseUS iOS Data Recovery Pro for Windows costs only $69.95 and EaseUS iOS Data Recovery Pro for Mac costs just $79.95. I recommend you purchase it today so you will never have to lose and data whether you mistakenly deleted it or lost it somehow. Click here to buy the EaseUS iOS Data Recovery for Windows now. Click here to buy the EaseUS iOS Data Recovery for Mac now. The EaseUS iOS Data Recovery Pro supports iOS7, iPhone 5s/5c, iPad Air, iPad with Retina Display and iPod Touch. The iOS Data Recovery Pro supports most lost data accident like device damage/ loss/ locked, jailbreak, iOS upgrade. Export the recovered data to your computer. Yes it is that simple to recover your deleted or lost files from your iPhone or iPad. Tell me what you think of this tool in the comment section below. Well I’ve already tried Easeus application for recovery of some photos from my Iphone 4s and it worked really great. I must say I’m really happy with it’s performance. Next thing is it also recover sms and other call logs. Well I am not an iPhone user but many of my friends are. Some time ago one of my friend lost her phone’s data and was helpless. She could not recover her data back. I guess I am going to suggest this tool to her. Actually some time back I found out the way to transfer the contacts to an iPhone from PC but was searching for such kinda tool. I once tried the free version of EASE US. I was disappointed because all the important functions a data recovery tool should have were premium. The question I asked myself was: ‘why make it ‘free’ when you really want it ‘premium’? In that wise, I’ll advise your readers to check out the premium version: the free edition is simply not worth it! BTW, I’ve added your blog to the list. Congratulations…you’re doing a great job here. Nice Information, Easy way to recover ios data, Thanks for sharing…. Well I was searching for good and best data recovery application since a long time and I’d say EaseUS iOS would be ultimate choice for data recovery. I’m gonna try that now. EaseUS has some great free products as well. I like what they have created over there and it is a company often overlooked. I am glad you wrote about them. I find their products interesting and useful. I hope a lot of people will begin to see the products differently from this review. Thanks for the review, it’s really useful for me. I used to recover my iPhone data with iOS data recovery, works well too. share it here as an alternative. Great, Informative Post, like this one must be maintained so I’ll put this one on my bookmark list of Data Recovery Specialist. Thanks for this wonderful post and hoping to post more of this. Have Great Day. I inquire about iPhone data recovery software to UK data recovery professionals (http://www.ukdatarecoveryprofessionals.com) and they advice me to use Ease US IOS Data Recovery Pro software. After reading this post, it seems to me that they suggest me a best software to protect my iPhone data. I used the free version of Ease US IOS Data Recovery Pro software and now I want to use the premium version. Thank you Datatrack Labs Ltd (http://www.datatrack-labs.co.uk), advice me to use the software.